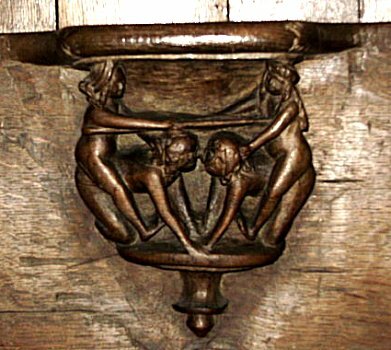 In the church Notre Dame des Recollets, in the center of the small town of Verviers, near Liege, 1674, 200 cm, light sandstone painted black. This Mother of Mercy is called Virgin of the Recollects because her church used to be a monastery chapel of the Recollects, an extinct reformed branch of the Franciscan order. She became famous in the year 1692. On the morning of September 18th a terrible earthquake hit the region of Verviers, with two bad aftershocks following in the afternoon. In fear, the faithful gathered outside the church before the Virgin, who was installed in a niche above the entrance, asking Heaven to end this punishment. Later some believers entered the church for evening prayers. When they came back out they noticed that the positions of Mother Mary and Baby Jesus had changed completely. The statue had not broken, but Jesus had turned towards his Mother's heart and her hand now held his. The faithful took this to mean that their prayers had been answered and the Mother of God had calmed the Lord's wrath. One hundred and four witnesses of all ages and walks of life were questioned and testified before a notary. Nonetheless, after a few years a spirit of doubt spread again and so, four years after the events, the same witnesses were asked to reconfirm their testimonies. This they dutifully did, again before a notary. After the miracle of 1692 the Madonna was moved to the interior of the church. Since sandstone darkens easily, she must have accrued some patina before that. She was darkened more by the smoke of candles and when the church was burnt during an armed conflict in 1810. Hence she earned her title Black Madonna through miracles and fire. In 1855 Father Meunier ordered the statue cleaned and uniformly painted black. It is a Belgium custom to honor special Madonnas every seven years with a big festival, called Septennales (from Latin septem = seven). In Verviers such a festival is celebrated throughout the month of September with religious, cultural, and social events. The last one was held in 2007. To the right of the manor house is a little way side shrine to “Our miraculous Lady of Foy” as the inscription says. It refers to an interesting Madonna only 20 km away in her village Foy-Notre-Dame. Some also think of this Madonna as black. She was discovered on 7/6/1609 inside an ancient oak tree that had been cut down. She was cast in a mold, probably around the year 1400 in Uetrecht, Netherlands, then placed in a hollow in the oak tree, which eventually grew around her, hiding her completely from view. Once the rediscovered statuette was washed and repaired, she was placed in another oak next to her former home tree. There she led a quiet existence for nine years, until the first miracle was attributed to her in 1616. Two years later the first little chapel was built for her, which later gradually became one of the most beautiful Baroque churches of Belgium, sporting paintings of students of Rubens. 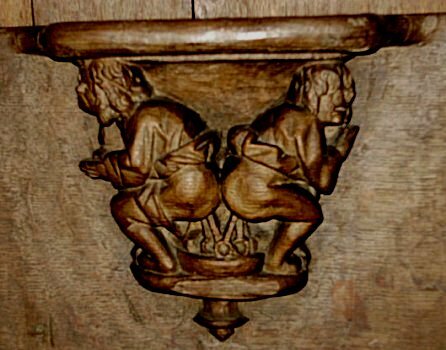 In the church Saint-Nicolas-Outremeuse, Rue Fosse-aux-Raines 9, 4020 Liège, 16th century, life size, painted wood. Open Mon, Tue, Thurs, 8-12, Sundays during mass at 11:30 a.m. and 6:30 p.m.
Outremeuse is a part of town that is surrounded by two arms of the river Meuse. Hence its name, which means: between the Meuse. This neighborhood has a very strong sense of identity. It calls itself the “free republic of Outremeuse” and possesses its own festival, folklore, fun rituals, cartoon characters, special “fire water”, and of course, its own Black Madonna. In case anybody should ever doubt that she is indeed Black, or if you can't get into the church, every other house on the street leading to her church has a little shrine to the Black Madonna. Her special day is August 15th, the feast of the Assumption of Mary, a national holiday in France and Belgium. The “free republic of Outremeuse” celebrates it for 3 days with lots of music, drinking, parades, puppet shows and a procession of the Black Madonna. She is carried by six Scouts of Unity of Our Lady of Outremeuse and the faithful place flowers on her float as she comes by. If you find the church locked, ask in the bar across the street if this nice lady still has the foot long key or if somebody else could open it for you. If you say you come from far away and are writing a book, you might get lucky. According to the Belgian TV program (see footnote), this is one of eight Black Madonnas in Belgium. Legend says that she was brought here by a crusader, though art historians date her to the end of the 15th century. The original chapel of Notre-Dame-de-la-Sarte was destroyed in the 16th century, during the Wars of Religion. So there stood the Black Madonna, disfigured in the ruins, a plaything for children. In the summer of 1621, with the town still occupied by Dutch Protestant troops, a local woman by name of Anne Hardy was passing the ruined chapel on her way home from collecting fire wood. Looking at the statue, she decided to give her a better home (or did she mean to burn her?!). She hid the Black Madonna among her firewood and meant to carry her off, but to her surprise, she could not lift the bundle at all, even when she asked two passers-by to help her. The three realized that the Madonna was refusing to leave her sanctuary and so they returned her to her niche. For this purpose the miraculous statue allowed herself to be picked up with ease. The news of this supernatural event immediately drew crowds of pilgrims. Three sworn affidavits were obtained from witnesses. Soon the chapel was rebuilt and Heaven granted more miracles. The church could not hold the crowds of pilgrims and so a bigger church was built from 1624 to 1628. In 1656, when a drought threatened the country with famine, the local government and clergy organized the usual public supplications to the Virgin, only this time they added a procession. The Black Madonna was solemnly brought down from her mountain into the city. She had scarcely returned to her sanctuary, when the rain, that was so desperately needed, began to fall abundantly. From then on, the ritual has been repeated every seven years. It begins with special devotions the night before August 15th, the feast day of the assumption of Mary into Heaven, followed by the procession the next day. The most recent of these rituals (as of this writing in 2013) was celebrated in 2012 with a nine day festival. 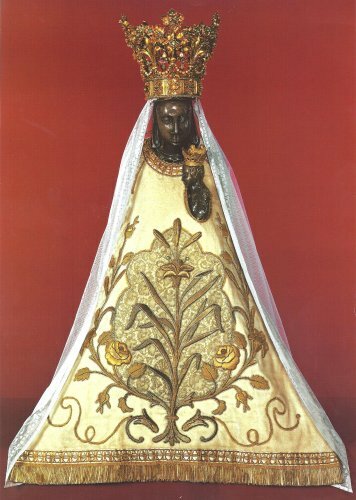 On June 26th 1896, the Black Madonna was canonically crowned. According to tradition, Ludwig IV of Thuringia sent this and three other Black Madonnas home to his wife St. Elisabeth of Hungary (d.1231) when he was on his way to the Crusades. He never made it further than Southern Italy, but Belgium profited from this treasure he secured. St. Elisabeth left the statue to her daughter Sophie of Brabant, who in turn left it to her daughter Matilda, Countess of Holland, who gave it to the church St. Martin in 1267. The church was declared a basilica in 1946. Marian devotion in Hal, however, goes back much further. In ancient times a sacred oak tree bearing a Madonna statue, was venerated. Several ancient European religions held oak trees sacred, from the devotees of Zeus in the South to the followers of Thor in the North. This particular sacred tree remains to this day. Early on a sanctuary was built to enclose it. Now the remains of the trunk of this king of trees are still honored in the crypt of St. Martin, where you'll also find the remains of several human monarchs. Our Lady of Hal is one of the first Madonnas of the type virgo lactans (nursing virgin) that appeared in Western Europe towards the end of the Middle Ages. With her right hand Mary offers her breast to baby Jesus. A little booklet in the sanctuary has much to say about this kind of Madonna. (*1) It acknowledges that depictions of the divine child being nursed by his mother go back not only to earliest Christian times, but probably have their roots in Egyptian Isis worship. In the Christian world they are justified by this Bible passage: "While he (Jesus) was speaking, a woman from the crowd called out and said to him, "Blessed is the womb that carried you and the breasts at which you nursed." (Luke 11:27) Although Jesus does not respond favorably to this woman's outcry, Christian liturgy echoes her veneration of Mary. E.g. in the octave of Christmas it says: "Blessed are the breasts that nursed Christ, the Lord." The Church Fathers, notably St. Augustin, often contemplated the miracle of the human Virgin-Mother nursing God as her baby. The author of the booklet in Hal also cites an old Latin hymn that sings out: "Oh glorious woman, elevated above the stars, Him who created you by his design, your sacred breast has nourished." The nursing virgin theme disappeared in middle and late Byzantine art, but reappeared in late medieval Italy, then France and the rest of Europe. 17th century Greek icons of this type are called 'the most holy nurturer of our life' (panaghia trophos). But let us return to Hal. After the reformation, a fierce struggle engulfed Belgium as Catholics and Protestants fought for control over the country. Our Lady of Hal, as the most ancient and most important Marian shrine of Belgium, became the symbol and rallying point for Belgium Catholics. Therefore the Protestants, who had already demolished so many statues, made it a priority to destroy the Black Madonna of Hal as well. In 1580 the deciding battle took place. An overwhelming Protestant army laid siege to the town, bombarding it with canon balls. But, legend says, the Queen of Heaven appeared on the city walls and intercepted the fiery balls in her lap. The gunpowder turned her black. The grateful population brought hundreds of canon balls that had landed inside the city walls to Our Lady, piling them under her bell tower. 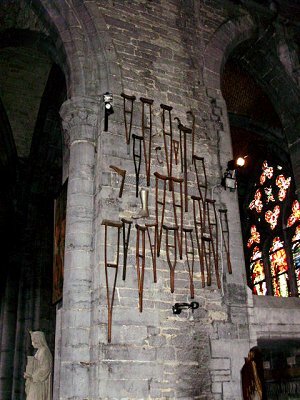 32 of those are still kept in the church. Other miracles attributed to this Black Madonna include saving the city from another siege in 1489, raising people from the dead, and healing many sick. In 1667 an epidemic ravaged the city and did not stop until on the first Sunday in September the Black Madonna was carried in a fervent procession along a path that stopped at all the churches and chapels of Hal dedicated to Our Lady. This so-called Wegom (big tour) is still followed with a solemn procession every year on the first Sunday in September. Pilgrims also walk this Wegom individually. It takes about 1 1/2 hours. The traditional 'small tour' is to circumambulate the altar space containing the statue three times (but not during masses). In 1664 the Augustinian monk Jacob Willemart (1626-1697) traveled from Brugge to Spain. Nobody knows why, but the good relations between Spanish and Belgian Augustinian communities must have played a role. Among other places, he visited the Augustinian monastery of Regula in Chipiona, where he listened with rapt attention to the miracle stories his Spanish brothers told about the Black Madonna of Regula. (see: Chipiona) He took notes which he later expanded upon, publishing a book under the title "The Sacred History of Blessed Mary of Regula". Before his departure his Spanish brothers gave him a little print of their Black Madonna. In the course of the next three years his personal devotion to Our Dear Lady of Regula kept growing. Once she healed him of a serious illness and after that he kept asking the Augustinians of Chipiona for an exact copy of the statue, promising that it would be made accessible for public veneration in his hometown. But his brothers refused, saying such a grace hadn't been bestowed upon anybody, not even the great ones on this earth (such as kings and cardinals). Yet in 1676 a friend of Brother Jacob Willemart traveled to Chipiona on a special mission and lo, it reaped great fruit: Soon the devotee of the Black Mother received a letter announcing that a copy, not a sculpture, but at least a painting, of the Mother was on its way to Brugge. It was to arrive on a ship with the fitting name Sancta Maria. 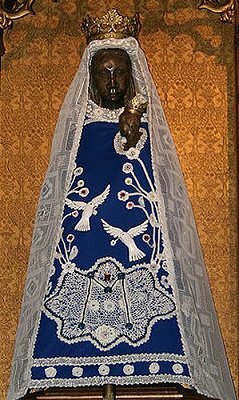 Our Lady of Regula quickly became one of the most beloved objects of devotion in the city, especially among the Spanish families. In less than two years her altar was covered in gold and silver ex-voti, proof, says Willemart, that the prayers of the faithful had been heard. During the French Revolution, in 1796, the French state dissolved the Augustinian order and sold all its lands and belongings. Only a few things could be saved from profanation, among them the Black Madonna of Brugge. She was hidden for a while and then appeared in the hospital-convent of the Pottery, whose nuns followed the rule of St. Augustine. Though they did not belong to the same order as the Augustinian brothers, they did have a bond with them. Here she remains today, newly restored in 2004 and still intriguing her Belgian children. *1: I.e. that soul would have to spend 40 days less in purgatory before being admitted into Heaven. *2: Scholars doubt his account, of which there is little proof. They think that he projected the celebration of the arrival of Duke Karel van Villa Hermosa, which took place 2 months before Our Lady came, onto her entrance into the city. ("Onze-Lieve-Vrouw van Regula: de Zwarte Madonna" a booklet published by the Stedelijke Musea Brugge 2004, p.7) Who knows. Maybe the Duke's canons and decorations were still in place and were lit up again for the Queen of Heaven.